With the ink from the 2016 Rio Summer Olympics still drying in the history books, all eyes are focused on the Tokyo Games that’ll be held in 2020 – an event in which preparations are well underway for. At the Rio Games, Japan reportedly shot and broadcast some of the events in 8K (Super Hi-Vision) as well as virtual reality as a pilot ahead of its own Games. Anyone that keeps up with technology knows this is an ambitious goal as 4K televisions are just now reaching mainstream affordability. As of today, you can count the number of 8K systems for sale on one hand and you’ll need well over $100K to bring one home which is something that those in Japan want to change by 2020. A new report from Nikkei claims that Panasonic, Sony and others will be partnering with broadcaster NHK to develop the technology needed to broadcast and watch 8K content. Specifically, NHK will work on creating the required data compression and sound technology as well as related standards while the set makers will focus on things like image processors and splitting the cost of hardware development. While ambitious, one has to wonder whether or not the Japanese are getting a bit ahead of themselves. Advancements in television and broadcast have traditionally come at a snail’s pace. Heck, there are even some people still using CRT sets while on the flip side, 4K content is still incredibly rare. I’m all for innovation but planning to hop past 4K so quickly just doesn’t seem plausible. TV broadcasters are still on 1080i, and you know what? They can stay there! At this point Netflix/Hulu/Showtime/HBO are making cable not only a terrible value proposition, but also technologically irrelevant since they can support far higher resolutions without any issues. As long as people have fast enough internet (100 mb/s is becoming quite standard) all Netflix has to do is flip a switch and all 8K content is supported, we just have to make it. 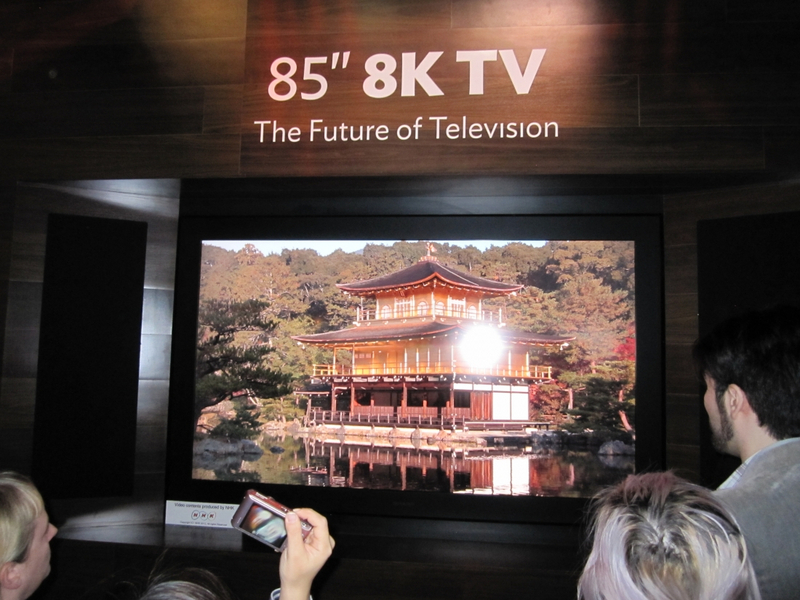 I really wouldn't be surprised if 8K TV's were somewhat obtainable by the masses in 2020. No reason to stop at 4K when the tech required to make 4K possible immediately makes 8K possible. Surely a 60inch 4k and 8k tv side by side wouldn't be much improvement. Maybe a 100inch 8k would be ideal. Blue Falcon and Jamlad like this. I don't know if anyone here knows this but they have been shooting HD video in japan since the early 80s. So to have them taking about 8k now is not really that groundbreaking. I should get into the business if selling bandwidth. I mean, everywhere I look people are just throwing it away these days. 8k sets? please. I've seen like 2 setups in my life that could really use that, and they aren't in your house... but money is money, and 8k sounds far better than 4k, so I'm sold! Just your friendly reminder that the "you can't tell the difference between 1080 and 4k" talking point was spread by telecoms that are too cheap to invest in infustructure spending to support it. Infustruture that supports 4k also means faster internet speeds. Blue Falcon and Greg S like this. I'm simply waiting for 16k. About time... My phone is already 4k! Trying so hard to get ahead of the curve before the next Olympics. When will marketers and broadcasters realise? NOBODY cares about the Olympics. Maybe you don't, but millions of other people do. It's one of the most watched events on TV and in person. Even with my glasses on I can barely see in 1080p. It's one of the most watched events on TV and in person. The Rio games were mostly devoid of spectators, the British Army were called in to fill seats for London 2012 and it's only the most watched event on TV because there isn't anything else on. Just blanket coverage from start to finish and since most networks assume it's that popular, they don't bother airing anything that comes close to competing. Just mind numbing crap and reruns. That's what happens when you blanket ban a country. Under this guise, every country should be banned - including the USA. Except not, since I also mentioned London 2012 where there was no blanket ban on Russia but there was still wall to wall coverage and no real televisual competition. And let's be honest, that ban did nothing for the viewing figures because nobody really cares about the Olympics. Perhaps you're right...many are just not interested in sports?